Two switchable voicings. Compact size. Tight bottom end. Jetter's core business is overdrive pedals, which is what this pedal offers. 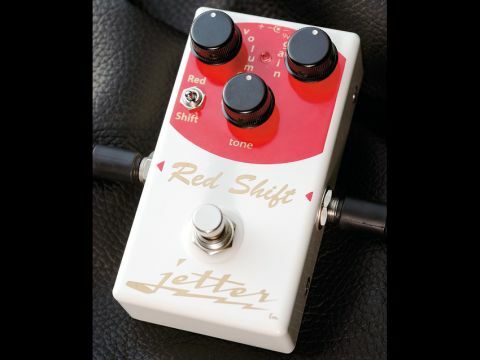 The Red Shift is developed from the earlier Gain Stage Red pedal and provides that unit's sounds with the toggle switch in the Red position. "The Red Shift offers medium gain valve amp-like overdrive." Switch to Shift, however, and you get a rather different voicing. With a tight bottom end, and crisp string separation when playing chords, the Red Shift offers medium gain valve amp-like overdrive - smooth and full with a nice amount of compression for sustain in the Red position. Switch to Shift, however, and you find a sound closer to the throaty rawk of a vintage Marshall.